It’s a little hard to explain or wrap up Quilt Festival. It’s big and overwhelming, and I think it’s different for everyone. The first year I attended, it was mostly about curiosity, and a little bit to thank sponsors for supporting my husband’s IBOL project to get sewing supplies to women in Iraq. I was completely overwhelmed and definitely had the feeling that everyone else knew what was going on and I was clueless. 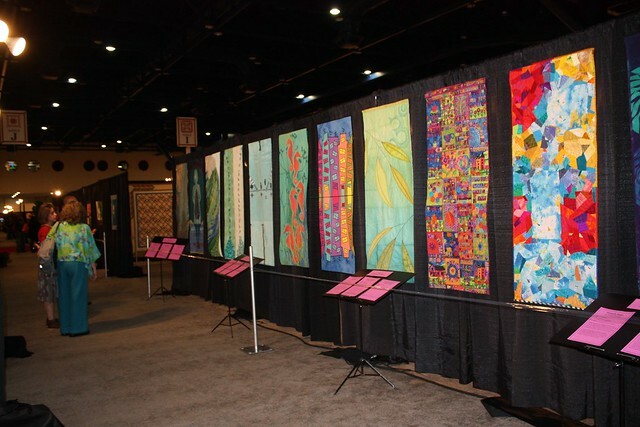 The second time I attended was when Twelve by Twelve, the online quilt challenge group i belonged to, had a special exhibit. I had a home base at the exhibit and a bunch of good friends to experience the show with. It was much more fun and I know I got a lot more out of the experience. This year, I went for three reasons: one, I have a piece in this year’s Dinner@8 special exhibit and I wanted to experience being part of that group of ladies; two, it was a great excuse to visit my bestie Deborah and spend time with her; and three, I’m at a point in my “career” where making contacts is important to moving forward and Houston is a good place for that (though I suspect Market is better than Festival, but I’ll take what I can get). 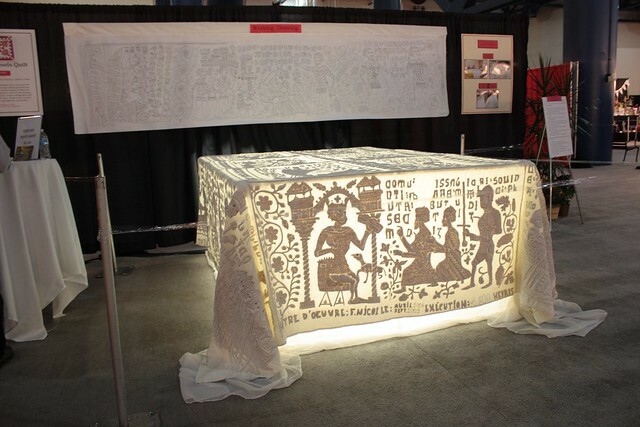 2014 is/was Quilts Inc’s 40th Anniversary so they celebrated with a Ruby Jubilee. Overall I was super impressed with the look of the show. I think there was great use of vertical space and an unexpected variety in ways of exhibiting work. As soon as Market opened a week before Festival, it seemed everyone was posting photos of the dramatic vortex of red and white quilts. I was curious as to whether it was part of the Infinite Variety show that had been in New York a few years ago, or not. Info at the show confirmed that this collection was very much inspired by Infinite Variety. I’m not entirely sure what this photo exhibit was about. 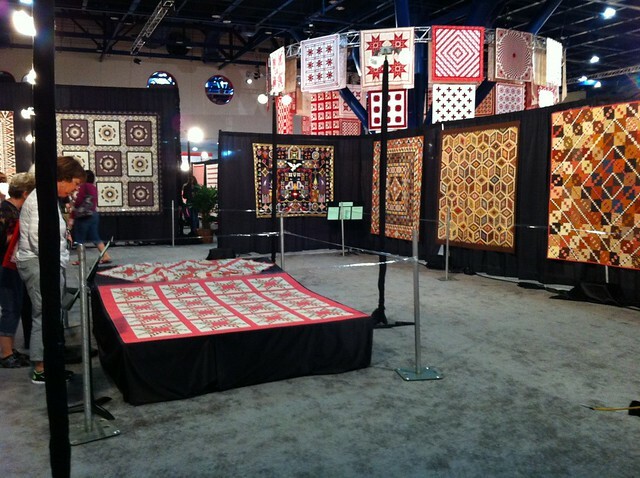 It may just have been to fill some space and/or show that quilting is worldwide. What I did like was that it was floor to ceiling. All that use of vertical space broke up the rows and rows of eye level quilts in a nice, and surprisingly unobtrusive way. The Tristan Boutis was probably the most inspired exhibit I saw. A boutis is a french style of quilting with only two layers stitched together and stuffing in select spots to accentuate the design. This is a reproduction of a historic boutis showing the story of the knight Tristan. I love the way the glowing display highlights the construction of the textile. There were a few other plinths too. As a viewer, it was very engaging to be able to see things at eye level, but also to look up and down and way up. Here’s one side of the Dinner@8 exhibit with my friends Deborah and Sarah discussing the work. The colors story on this wall was gorgeous. Much fun was had taking selfies in front of my Dinner@8 quilt, Selfie. I was so excited to see “the Donnas” and Cheryl from the Hawaii Quilt guild. Here’s Donna E and I with my quilt. 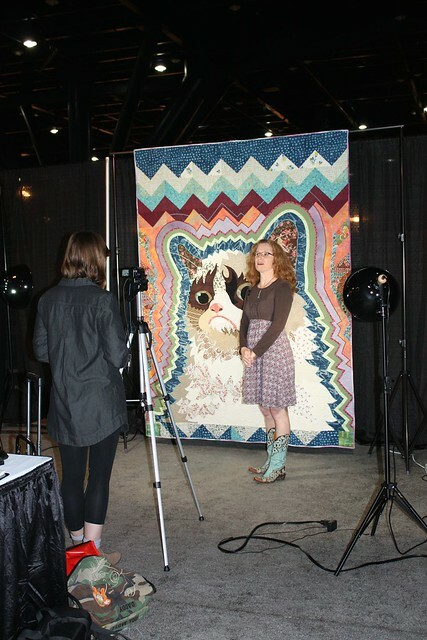 Deborah and I participated in The Quilt Alliance’s Save Our Stories project and filmed three minute interviews with our quilts. She talked about her piece in the Festival of Art Quilts: Home exhibit and I brought my pop art Zeitgeist to hang just for the interview. Open Studios is a nice place to rest one’s feet and pick up a few tips and tricks. Betty Busby has charmed a big group of ladies with her paintstick on silk technique (and her bubbly personality, of course). I seem to run into Betty everywhere and it’s always a joy. In addition to the exhibits and the Open Studios, Houston is all about the vendors. I am sorry to say that I did not budget my time appropriately (maybe my wallet isn’t so sorry) and I did not get the chance to do any of the shopping I wanted to do. I actually had a list of fabrics and threads to check out. I did stop by Aurifil’s promotional booth and won a few spools at their gaming tables. Good fun — these guys know how to maximize promotion. I also took the opportunity to talk long arm options with a half dozen sewing machine vendors. I’m not ready to invest, but it may be the answer to the project I’m brewing. Of course, the socializing is a big part of the experience, and this year I went with the intention of matching names of people whose work I admire and their real-life selves. Dinner with Deborah, Chawne, and Sarah was so much fun. Not only did we have intelligent and interesting conversation, but we’re compatible on the goofiness scale too. here’s where we see that we all share the ability to roll our tongues. After Quilt Festival, Deborah and I continued on to La Grange, Texas to the Texas Quilt Museum to see an exhibit from the John Walsh collection. The trip was sooooooooo worth changing my flight and making the detour. John Walsh is the preeminent art quilt collector of the day and I have admired many of the works in his collection. Just about every art quilt I’ve ever looked up to as where I would like to be on my path is owned by John Walsh. It was great to see these pieces in the cloth. Some were surprising in the details and construction that one just can’t tell from a photo. All of them stood up to in person inspection. My favorite was New New York Beauty by Katherine Knauer (a new name and quilt to me), and Deborah’s was Tim Harding’s Surf Swimmers (deft use of simple folded and stitched bits of fabric to evoke water scenes). After the Quilt Museum, we continued on to San Antonio where we watched Deborah’s daughter’s high school band compete. It was quite the spectacle and they won silver in the state championships. All in All I had a fantastic five days in Texas and I definitely look forward to my next fiber art adventure with friends. 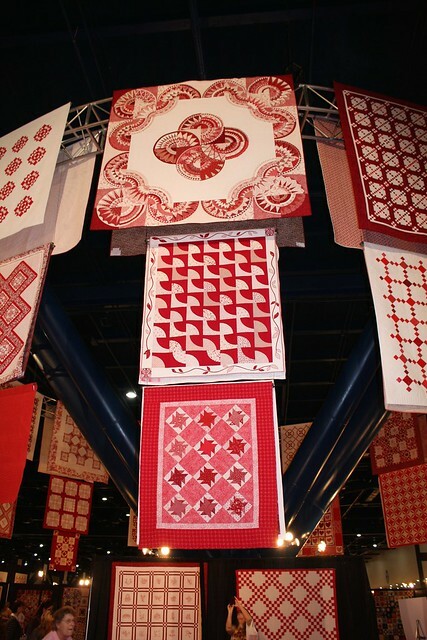 My next post will be about some of the quilts I saw and liked at the show.